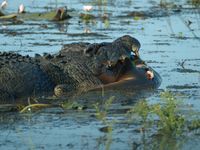 LAST week pictures surfaced of a crocodile eating a bull shark. 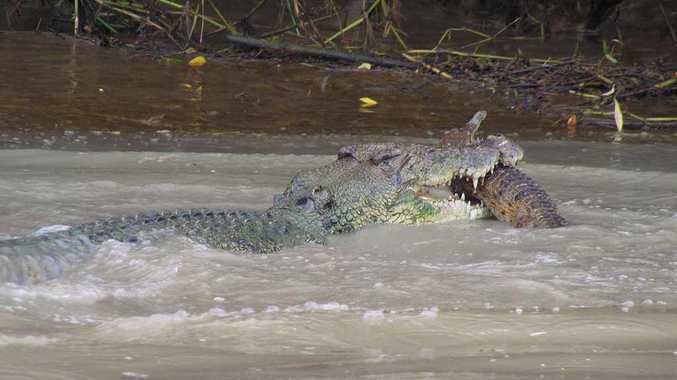 This week pictures have emerged of a 4m-long saltwater crocodile eating a 2m-long freshwater crocodile near Darwin. 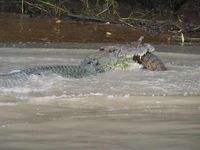 Adam Bowman, owner of Wallaroo Eco Tours, snapped the croc gorging on a fellow reptile during a flora and fauna boat tour on the Adelaide River, 70km southeast of Darwin. After he alerted shocked tourists, Mr Bowman told them it was a "once in a lifetime opportunity". "I haven't seen anything like this during 20 years of running crocodile tours," he said. 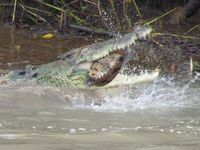 Last week, scores of tourists watched in awe a massive saltwater crocodile gorged itself on a bull shark in a wetland area near the northern coast of Australia. 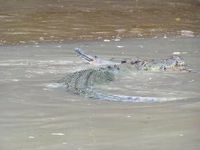 The 5m-long "saltie" was chomping on a shark estimated to be at least 3m long - when 90 tourists on two boats cruised past in the upper flood plains of the South Alligator River just over a week ago. The wetland is in Kakadu National Park, about 150km east of Darwin. The shark had already been bitten in two by the time the wild feast was photographed. Yellow Water Cruises tour guide Dean Cameron, 34, said the shark would have been 3m or longer and weighed 60kg. "It would have been amazing to see [the attack] - very wild footage. The croc would've taken the shark at night and then it would've had to take it to the bank to eat it." Mr Cameron, who was guiding one of the boats, said the visitors were overjoyed to witness the spectacle. "Nearly 100 people saw it and they were jumping for joy," he said. "They said this had made their Kakadu trip." Troy Scott, of Yellow Water Cruises, said last night that it was an extremely rare sight. "None of our guides had seen it before and some had been out there seven years."